In April 2016, the female Peregrine was almost certainly shot to death by an unidentified person videoed climbing into the breeding scrape flushing the female Peregrine from her nest. Hours later the video recorded the male Peregrine returning to the nest where he was immediately snared by one foot in a trap placed in the nest alongside the eggs. The trapped Peregrine was then left to suffer unimaginable agony for ten hours before further video captured an unidentified person holding a flashlight while removing the male falcon from the trap. The video then showed the falcon being stuffed into a bag before being taken away. Its important to understand this nest site was located in the middle of isolated heather moorland some 2 miles from the nearest public road. Such activity undertaken during the middle of the night shows a clear knowledge of the area having more in keeping with SAS activity, and the skills to have been carried out at the dead of night on such unforgiving heather moorland. The destruction of the nesting pair of Peregrines at the Bleasdale site in April 2016 marked the end of an important era for Forest of Bowland raptors. In 2017 and 2018 as far as I am aware, there were no occupied Peregrine falcon nests recorded on any of Bowland’s privately owned shooting estates. This has resulted in as many as16 historic Peregrine nest sites currently unoccupied. 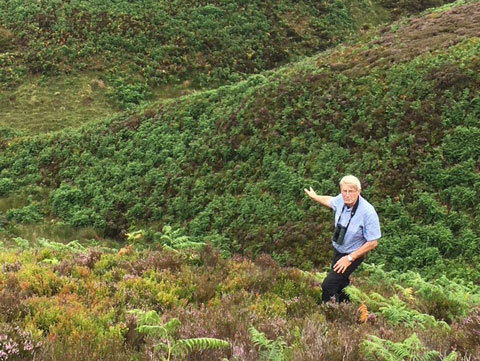 There has been no successful Hen Harriers nests sites recorded on any of Bowland’s privately owned estates since 2006. Terry Pickford making his second visit in two years to the Peregrine territory where in 2016 two breeding Peregrines were destroyed. Both of Terry’s subsequent visits undertaken in July of 2017 and 2018 proved the site had remained untenanted by Peregrines since the 2016 pair were destroyed. This case highlighted a major flaw in English wildlife legislation underlining the fact that bringing any successful criminal prosecution against the killers of protected raptors on grouse moors will be unlikely in the future. 2 comments to The killing of 2 Peregrines in 2016 at a Forest of Bowland eyrie brought about the end of an era. So to have brought the case the individual was identified from the Video and charged? Did he have landowner permission to do what he was doing? If so the landowner is also guilty and should be charged. If no permission the guy was committing armed trespass. The Judge was technically correct BUT misguided. It means that any person caught on a covert camera will escape justice and that is simply unacceptable. As the “Trial” was public there is no legal reason why the accused, and acquitted defendant cannot be named. So who was it and where does he live? The sooner we elect a Jeremy Corbyn led Labour government the better.I find it scandalous the amount of ‘insider influence ”that the landed gentry have in this day and age. Whenever I visit the Forest of Bowland I am appalled at the lack of birds of prey in their natural environment and habitat. Thank goodness for people like Terry Pickford and his team giving up their time and energy to highlight what is going on there. The sooner the better that driven grouse shooting is banned and a more wildlife friendly system is allowed to flourish, for the many who would visit and spend their money locally.